I don't know about you, but I'm constantly committing to hosting the holidays or big events, while completely ignoring the fact that, when it comes to dinnerware, I'm extremely underprepared. Something just happens to me in that moment where I get swept away with the anticipation of a great evening surrounded by family and friends and I subconsciously fail to recognize that in no way, shape or form do I have twenty-plus matching settings of any kind of dinner, stem or flatware. So after countless day-before panic attacks, I've managed to compile a few party-saving tips for a successful mix-and-match tablescape. And though the rules are few and far between, here are a few failsafe's you may need when pulling off the perfect mismatched affair. Likely, you have some sort of existing color palette through your everyday dishes and glassware, and though you may not have quite enough to make the rounds at the table, you can still stick with that general scheme. Even if your shades are not quite spot on, don't panic! These variances are your friend. 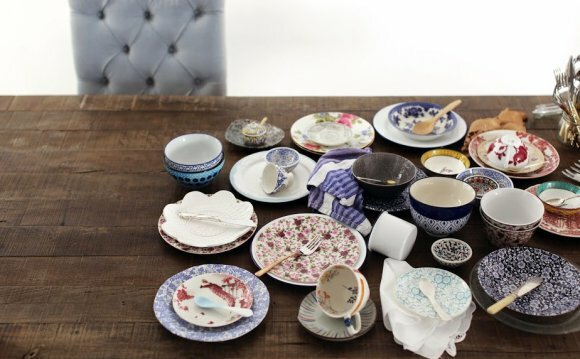 Hit up some vintage shops or discount aisles to pluck some pieces in coordinating hues to add in across your table. Adding florals that bridge the color gap (like the gorgeous example above from My Domaine) also helps to unify everything. Think of your flatware the way you would your jewelry, and alternate silvers and golds in glossy sheens or flat finishes. What your forks and spoons lack in conformity, they make up for with interest through varying shapes and sizes. We love Freutcake's mix seen above; it adds an approachable charm to a table that might feel stiff otherwise. Nothing is off limits here—channel Iris Apfel, more is more. There's something fun and exciting about a table that has surprises—where each setting is its own discovery. I have collected so many random dinner, salad and side plates over the years and each one always incites a story or memory. It's so great to have an opportunity to flaunt them on the table. I'd imagine the vintage plates above from Style Me Pretty have their own narratives to tell. A little consistency on a mismatched table can go a long way. Take a style cue from Hello Fashion, who uses the same twin and bud treatment on mix-and-match napkins. Whether it's through a runner, placemats, water glasses, or a unified floral scheme, having a common thread that weaves through your tablescape provides a little necessary cohesion to all the organized chaos. Table for 20? No problem, as long as you don't shy away from pattern and texture. Now is the time to break out those bold patterned bread plates and whimsical napkins and let them bring your table to life. When mixing your patterns, be sure to consider scale and style. There's something magical about a setting (like the one above from BLDG 25) that combines both a variety of styles like modern and traditional prints in varying scales.